Leading Exporter of sandwich boxes, corrugated boxes, outer cartons boxes and burger boxes from Mumbai. 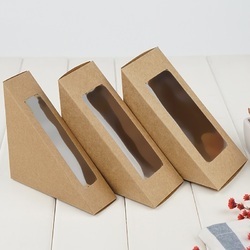 We are offering Sandwich Boxes to our clients. Developed at our vendors' premises, these boxes are developed with the aid of modern machinery and technology. To suit the exact requirements of the customers, these products can be customized as per their demands. We are offering Corrugated Boxes to our clients. The offered boxes are crafted with the help of superior quality material and advanced technology, under the supervision of our professionals. These boxes are widely applicable in various packaging industries for packing accessories, Fans, food items and many more. Acknowledge for their airtight packing, fine finish and durability these boxes are highly demanded by our clients. The offered range of boxes comprises items like fan boxes, pizza boxes, outer cartons, mobile boxes etc. We are the noted organization highly engaged in offering a wide assortment of Outer Cartons Boxes. The offered cartons are designed with one piece blank, where outer flaps meet at the center on both top and bottom surface of the box using top class material and advanced technology. These cartons are highly applicable for packing goods like food material, medicines, tools etc. Our offered cartons are available in varied colors, shapes, and size. We are offering Burger Boxes to our clients.